As a therapist, I have experimented and continue to experiment with various therapeutic techniques, interventions, and modalities, and this has grown over time into an eclectic synthesis of all the perspectives that I find have worked the best. However, even in this growth, I have found that the overarching model of ACT continues to be an ideal model in which to do therapy. All of these work together in what is often called the “hexaflex” (see below) and all work together towards the aim of psychological flexibility, as opposed to the rigidity that gets us into trouble in the first place. To me, this is all about cultivating greater and greater capacity to choose our own behaviours and reactions to both internal and external events. The more we can consciously choose our reactions to life, the more we can connect with what truly makes our lives richer and more meaningful – whatever that may be for you. What I love about ACT is that it easily incorporates the lovely techniques and perspectives that in and of themselves have some limitations. 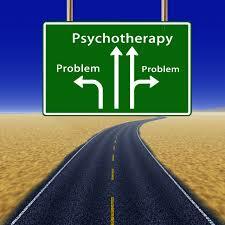 For example, I use aspects of CBT (Cognitive-Behavioural Therapy) that are incredibly effective. However, they are often limited by a client’s personal needs and emotional blocks. These CBT techniques fall under the “cognitive defusion” aspect of ACT – but because I can use this within a more holistic framework, it means that when I encounter blocks, I don’t have to stay within CBT. I can use mindfulness skills-training, for example, which is another aspect of ACT (Present Moment awareness) or emotional non-resistance strategies, which fall within the field of “acceptance”. All of this means that I can work with the incredible complexity of your humanity, have tools to use to get you wherever you want to go in therapy, and never get forced into narrow therapeutic perspectives that might mean you don’t get the very best and most efficient guidance to get through your problems. Even EMDR (Eye-Movement Desensitisation and Reprocessing) which is a huge part of my therapy and the technique I use for all small or large traumas, I envision as falling into the greater frame of ACT. It is it’s own thing, to be sure, but it allows for a combining of acceptance, defusion and values emphasis all at the same time. In fact, I might argue that it is essentially just the grand jackpot of cognitive defusion techniques that leads to tremendous choice and flexibility. ACT is the cutting-edge of modern therapy and is currently the fastest growing therapeutic modality in the world. This is not surprising, considering how seamlessly it incorporates previous systems of psychology and uses them together in some kind of uber-integrated model. It may effectively function as the “unified theory” equivalent in psychotherapy. However, it is by no means a perfect system. 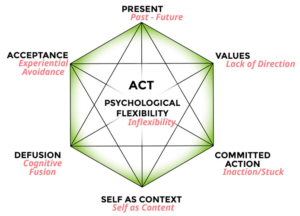 Strictly speaking, there are times when I find that I must leave the ACT model a little, or do things which are – from a purist’s perspective – contrary to its tenets which are based in relational frame theory. Examples of this occur sometimes when I am really pushing people in ideas of truth (using The Work of Byron Katie, perhaps) or when working with psychotic or dissociative clients for whom other ideas become primary. The other thing that is a double-edged sword with ACT is that there is no formalized accreditation or training process. This means that any therapist can say that they use ACT, without necessarily having any training or clue as to what it is all about. This has obvious possible drawbacks, but the nice thing is that it means that training and information is essential “open source” and this is surely what has allowed the tremendous surge in its availability and popularity.